Something fishy is going on at McDonald’s. As competition intensifies among fast-food chains, McDonald’s has begun test-marketing McMussels – the restaurant’s version of the popular shellfish. The item, now available at 627 restaurants in 12 mid-western cities, is available in 3 varieties – McMussels a la Ronald, McMussels McMarinara, and McMussels with cheese. By offering a wider variety of menu items, McDonald’s hopes to fend off rivals in the fiercely competitive fast-food arena, where franchises like Burger King and Wendy’s have gained market share in recent years. True to McDonald’s mantra of “standardization,” each McMussel conforms to strict size, shape and weight guidelines. Cultivated at the fast-food giant’s Urbana, Illinois food processing facility, McDonald’s harvests mussels that are all perfectly oval, symmetrical, and weigh in at an identical .067 of an ounce each. 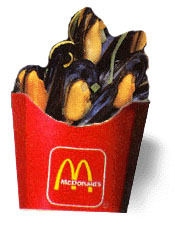 How McDonald’s achieves such uniformity among its mussels is somewhat of a mystery, but industry sources speculate the fast-food marketer has taken to cloning, a charge McDonald’s disputes. If true, it would mark the first time cloning technology has been used for commercial purposes. But the McDonald’s brass disagrees. “So far, initial reaction has been positive," says Reed. "We’re making shellfish -- an item that has been economically out of reach to many families -- affordable to large segments of diners. Customers have been clamoring for tasty low-fat, low cholesterol alternatives, and the McMussels product delivers on all accounts,” he added. A Little Help from the Little Mermaid. McDonald’s has set the price of McMussels at $2.49 per dozen, or an 18-piece “supersized” order for an additional 39 cents. To spur sales, the company has entered into a cross promotional arrangement with Disney, Inc., offering Little Mermaid collectibles for 99 cents with the purchase of any McMussels basket. Regional television, print and online advertising centers around the themes, “Mmmm Mmmm McMussels!” and “Sea What’s Cooking at McDonald’s Now!” The $5 million campaign was created by the Benton & Bowels unit of the Scraatchi & Scraatchi Interepublic Group. That’s a lot of marketing “mussel.” But whether McMussels catch on with consumers remains to be seen. An ad from McDonald's new McMussels campaign.